Madison -- This week, Wisconsin Governor Scott Walker got tripped up by the truth. First Walker announced he was going to slash $300 million from the University of Wisconsin budget, devastating cuts that will fall hardest on students; then he said he wanted to make the university system operate more like a port authority than a public university. But what really got people riled were his edits to the university's mission statement. Buried in his proposed budget bill -- on page 546 out of a whopping 1839 -- Walker scratched out "the search for truth" and took an ax to Wisconsin Idea, the guiding philosophy that the university is created to solve problems and improve people's lives beyond the boundaries of the campus. Instead he wanted the university to "meet the state's workforce needs." For extra measure, he scratched out "the legislature finds it in the public interest" to provide a system of higher education; he instead made it a "constitutional obligation." 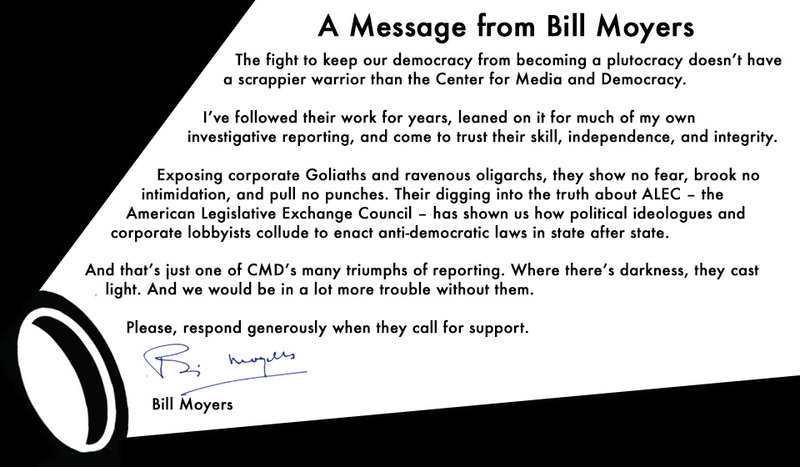 The ideological sneak attack on a great public institution is classic Walker. While campaigning for governor with his brown bag lunch in 2010, he forgot to mention to voters that his first act would be to go after public workers and collective bargaining. Instead he "dropped the bomb" in February 2011 when he introduced a "budget repair bill" that took away collective bargaining rights from nurses, teachers and snow plow drivers. But this week's sneak attack on the university system blew up in his face when the Center for Media and Democracy published a screenshot of the Walker's 2015-2017 executive budget graphically illustrating the ideological assault on the mission of the University of Wisconsin system. By noon, our story was taken up by the state's largest paper the Milwaukee Journal Sentinel. The Nation, argued that Walker “is launching a war on the truth. Literally.” By early afternoon, the story had gone national through an AP wire and it was soon in the Washington Post. 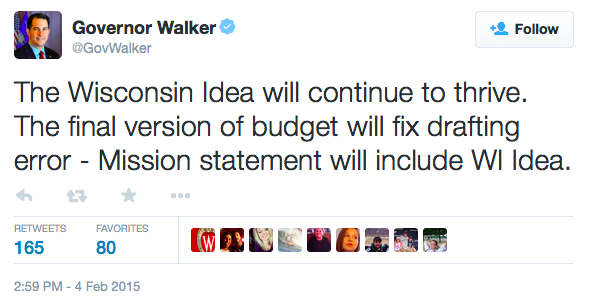 The "Wisconsin Idea" was trending on Facebook and Twitter exploded with indignation and gallows humor, while parodies cropped up of Walker going at it, editing other historical documents. The first reactions from the professors and students at the university were disbelief and shock. President Ray Cross issued a statement suggesting that the Wisconsin Idea is “embedded in our DNA … it is the reason the UW System exists,” and history professor David McDonald called it “absolutely fundamental to our identity.” Dean Underwood of the UW School of Education told CMD, "We are different than most of our research institution peers because we are dedicated to tackling the hardest issues in the state for the public good. It would be a tragedy and travesty to lose that." Meanwhile, lawmakers on both sides of the aisle were fuming. Why were they not told about the changes? The next day the story was on the front page of every newspaper in the state with the screenshot and blaring headlines, such as "Walker Backtracks on Striking Truth and the Human Condition from the Wisconsin Idea." Suspicions lingered. Was this really a "drafting error" or a "gubernatorial assault on the expansive view on higher education in Wisconsin?" Ry Rivard asked in an Inside Higher Ed piece. In search of an answer, the Journal Sentinel began to page through the massive drafting file on Thursday morning. It turned out that the changes were far from innocuous “drafting errors.” Instead, Walker officials from the Department of Administration had specifically asked for the changes to the mission statement. And UW officials did not "overlook" the language, they were quite upset about it. An email was released showing that when the university officially protested the language to Walker's budget team they were rebuffed. This time round, Walker issued a lengthy statement blaming "miscommunication" between his office and the his budget staff in the Department of Administration. "Unfortunately, when my office told the budget staff to keep it simple, they took that to mean that we only wanted workforce readiness language in the mission when we really wanted the language added to the existing mission statement." The person responsible would not be disciplined, the governor assured the Associated Press. Now, his budget director has come forward to dutifully fall on the sword and suggest that the whole "drop the bomb on the university" thing was his idea. The notion is laughable. Walker is a notorious micro-manager who has been a career politician his entire adult life. He prepared this budget with his eye on the presidency. It is chock full of red meat for the far-right including a property tax freeze, an expansion in school vouchers, and an attack on Common Core. Moreover, as Democratic Senator Jon Erpenbach pointed out: "This isn't something that would be an oversight. This is the governor directly aiming his arrow at the heart of the UW and what it's all about." One thing is for sure, in a week when Walker wanted to be enjoying his surge in New Hampshire and telling America he is a "fresh face," he is left explaining why he has so much trouble with the truth. And the university is left facing $300 million in devastating cuts, when neighboring states are investing in higher education, cuts that will fall hardest on students, especially from rural areas of Wisconsin. 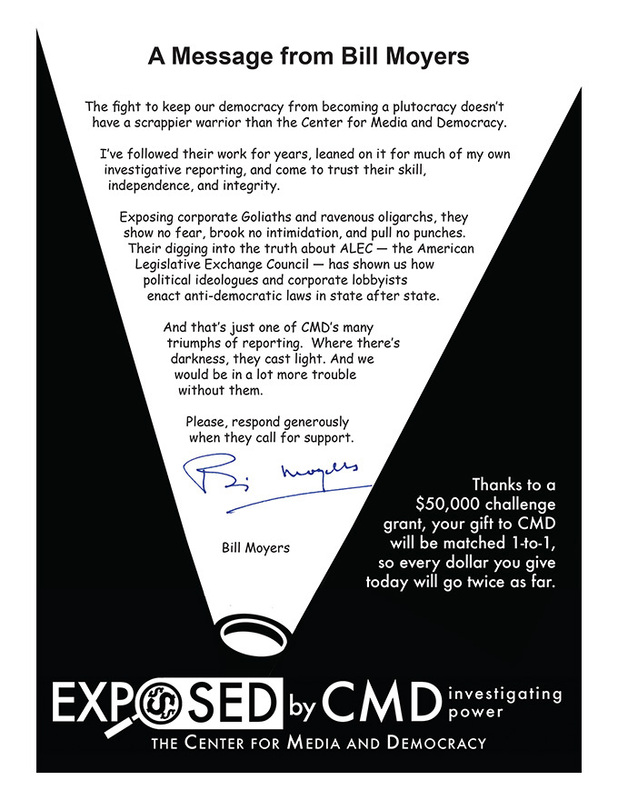 Read the email showing how Walker's budget analyst ordered the removal of the "public interest" clause here. On Thursday, CMD's Lisa Graves went on All in With Chris Hayes on MSNBC to discuss Walker's bumbling backtrack. Check out the clip here.